Microsoft said on Monday that Skype Lite app can now be used to make group video calls as the company continues to expand the offering of its messaging and video calling service for the Indian market where much of the population lives by on slow networks and possesses outdated and entry level handsets. But that's not all. Microsoft is also making it easier than ever for people to attend a video call. Users who do not have a Skype account can join a group video call, the company said. Skype Lite users can invite even those friends who have not registered with Skype and yet those friends would be able to attend the calls on their phones as well as on desktops and laptops. The invitation link, which can be shared via WhatsApp or any other medium, prompts users to download Skype Lite app on their phone, and on the PC, it prompts them to install an extension (Skype Web extension, if it is not already installed) on some Web browsers (i.e., Chrome) to facilitate the video call. Notably, no extension or account is required if the guest user just wants to have a text conversation with the host. The invitation link is valid for 24 hours. The addition of group video calling comes on the occasion of Diwali, the festival of light where people understandably make more phone calls and send more texts as they connect with their friends and family to share pleasantries. 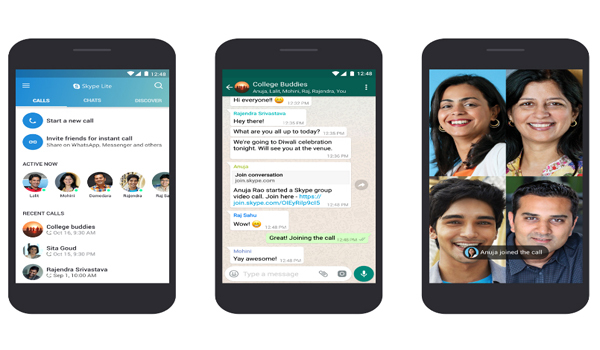 Facebook-owned WhatsApp, which has over 200 million users in India, doesn't offer group video calling functionality. Microsoft chief executive officer Satya Nadella announced Skype Lite for the Indian market earlier this year. The app is a stripped version of the marquee Skype app and has been designed to work swiftly on slow networks and handsets with limited resources. It is exclusively available for Android users. The company has been aggressively expanding the offerings of Skype Lite to make the app more relevant to people in the country. Earlier this year, Microsoft added support for Aadhaar, which allows users on a video call to authenticate each other. The company has also added support for several Indian languages. In August, it also added a machine learning-powered feature called "SMS Insights" to make sense of spams and pull relevant information on its own. According to Skype Lite's Google Play listing, the app has been downloaded between one million to five million times since launch earlier this year.